This is a review of the EP Fight Fire With Fire (7.5) by a new band Calgary which is released on the 2nd December. 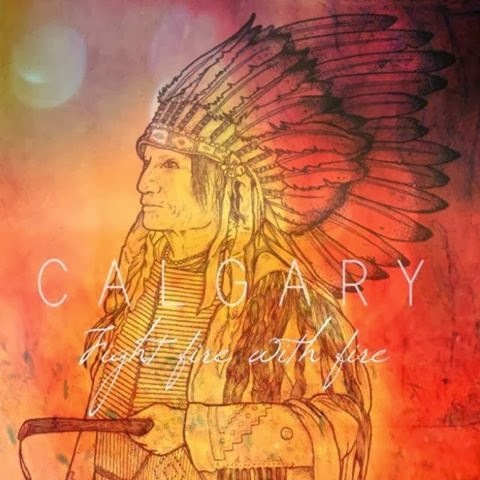 The album kicks off with “Fight Fire With Fire” a breezy sun drenched guitar pop song with a catchy chorus, which will get stuck in your head for days. Lead singer, Jakob has a voice which is silky smooth, complimenting the bouncy guitar work. The song is sure to feature on many TV programmes and film in due course. Next up is “In My Arms” which starts off as a straightforward love song. Around the 2 minute mark the songs changes building layers of guitars and haunting backing vocals, giving a sense this song may be about a love lost. This is a very powerful emotive song, which shows another side to the band and is by far the best track on the EP. “Run, Run” is in a similar mould to title track but is a very listenable track, which again features a ridiculously catchy chorus. The guitar work shows flourishes keeping the listener interested. The EP ends on the track “Shine”, lead singer, Jakob adopts a rhyming vocal style for the verses and a sung chorus showing his high vocal range. The guitar work is intricate and again the whole track is lyrically upbeat. It would be nice to see more diversity on future releases, which is hinted at with the standout track “In My Arms”. The EP is a collection of perfectly crafted pop /rock song, which are upbeat and lyrically intelligent.